The acclaimed authors of The Map of Moments and The Secret Journeys of Jack London join creative forces once more in this epic, standalone novel—an exciting dark fantasy of gods and mortals, fools and heroes, saviors and destroyers with a brilliant beam of hope at its core--that should more than appeal to readers of N.K. Jemisin and Brandon Sanderson. 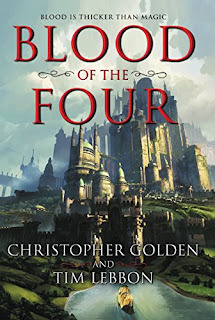 A standalone epic fantasy from two of my favorite authors, and one that's being compared to the work of both Jemisin and Sanderson? This is a must-read. Beautiful cover! I do think fantasy books have the best covers of any genre. Two great authors together? Sounds like a brilliant idea! Hope you enjoy it! My husband might like this one. Making a note of it. Great authors and it sounds really good. The cover is gorgeous! Nice pick.